No, that image isn’t a Photoshop. At some point, this actually happened. The Subaru Forester, as we all know, is reliable transportation for people who live in New Hampshire, and also lesbians. It’s also reliable transportation for people who live in India. But in India, lesbians don’t buy it. Partially because lesbianism has not yet reached India, but also because over there, it doesn’t carry the Subaru badge. Instead, Indians know the Subaru Forester as the Chevrolet Forester. Yes, it’s precisely the same vehicle as the one sold in America. All-wheel drive. That 2.5-liter flat-four that’s quickly becoming Subaru’s version of the 3800 V6. Styling done by a committee of people who responded to an ad in the newspaper looking for individuals without a personality. We often hear the term “rebadge” to describe a car that’s mechanically identical, but visually different. 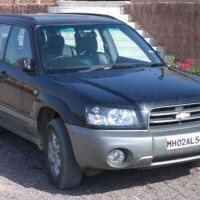 Not so here: the Chevrolet Forester is quite literally a Subaru Forester with a bowtie slapped on the front. When the Forester went on sale in the late ‘90s, General Motors owned a stake in Fuji Heavy Industries, which is the company that owns Subaru. 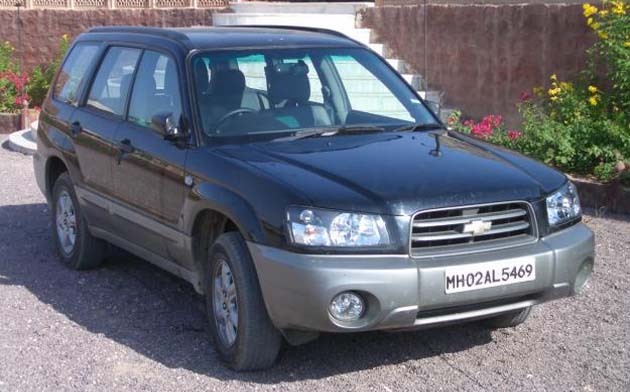 And since General Motors is hell-bent on rebadging every car ever made so the Chevrolet name can go worldwide, Subaru was a logical choice to teach India about Chevrolet. Of course, all good things must come to an end – a saying that apparently applies to bad things, too. In 2005, GM sold its Fuji stake for $740 million, or about enough to pay factory workers’ pensions for eleven hours. The Chevrolet Forester died, bringing an end to one of the most ridiculous rebadges in automotive history. As a TTAC reader who was curious, I have to say well done! Well done, indeed. Much better than the awful blog I had in my 20s. But were you bi-curious enough to buy a Subaru? In the states, when Subaru was just a one-off Japanese car comnpay, there was a study done and it turned out a majority of lesbians bought Subaru’s. So much so, that Subaru would be a sponsor at many lesbian-centric events like the Virginia Slims golf tournaments and advertised in gay magazines too. Swear to God; not making this stuff up. You could have made all of this up and I still wouldn’t care – awesome article! No one ever bought a Subaru Forester for it’s looks, foeaunttrly, because they are all pretty much the next bunch of random styling cues trying to look practical. People buy them because they smallish, practical, reasonably priced, have the flat engine and AWD, and a reputation for doing things a bit differently. And people buy them because they are lesbians. I know of 2 lesbians that currently own new Subarus. One of them went from a 2005 Forester to a 2012 Forester. The other one went from a Malibu Maxx to a new Outback. Not sure what the story is with Subarus and ladies who like ladies buying them, but it’s fascinating. I’m just a lesbian trapped in a man’s body. I wonder if I can get a discount?